At that point, I knew something was up. The Tigers were playing at 7:30. 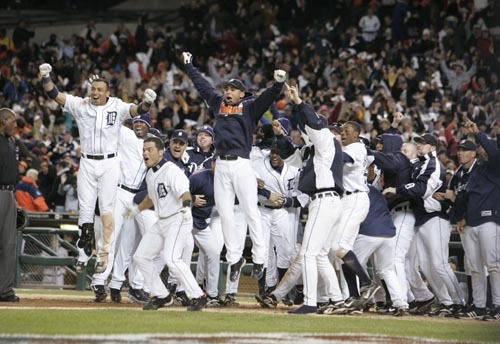 I think I’m still a little in shock I’ll be attending a World Series game… in Comerica Park… rooting for the Tigers. I’ll be able to tell my kids about it much like dads are recollecting The Roar of ’84 with their sons and daughters. I’ll be there in person, in the brisk autumn air, surrounded by drunks, cheering until my throat is hoarse. Never has this been baseball season to me. It’s always been football season. The Tigers were usually 30 games back by August and attention had shifted to the misfit Lions. Or for some to the safe-bet Red Wings. But this year, downtown Detroit, and Michigan as a whole, is being revived–infused with hope–by the most unsuspecting of heroes. The 119-loss Detroit Tigers. It’s a shame it isn’t a Holy Spirit revival yet, but hey, I guess we have to start somewhere. And why not with the Tigers. Just shows that anything is possible. lucky dawg! take some good pics and capture the magic for the rest of us! you have no idea how many people are insanely jealous of you reading your post! have a blast!! If Amy and I were still living in Chicago I would have killed to be in the Detroit area during this time. I didn't get tickets (yet), but I am not going to pass up the chance to be a part of the atmosphere. Amy and I are going out to eat downtown Saturday then heading to someplace like Cheli's Chilli to watch the game.